There’s something so compelling and timeless about the Persephone/Hades romance – the beauty falling in love with the beast – as I choose to read the story as though she did end up falling for him over time. You know, despite the whole caveman club-her-over-the-head-and-drag-her-back-to-his-hovel/palace/Underworld-and-force-her-to-stay-there bit. Perhaps it’s the idea of such polar opposites attracting, of finding redemption in another’s love, of compromise, of coming to a deeper understanding of a person despite misconceptions or preconceptions, of loving someone enough to let them go, or perhaps it’s the idea of a hard-won, though slightly tragic, love that flourishes despite the odds. And more than likely it’s a combination of all of those things. But whatever the reason, it’s a romance that remains one of my favorites. In Kaitlin Bevis’s retelling, the setting is modern day and it’s as though this particular myth hasn’t yet happened. 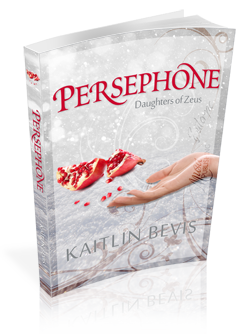 Persephone, 16, has been raised by her mother as a human with no knowledge of her powers or her divine heritage. Living in Athens, GA, Persephone attends a normal high school, pals around with her bestie Melissa, and loves her part-time job at her mother’s flower shop, Demeter’s Garden. But when strange, unexplainable events begin occurring around her, she learns that she’s a goddess going through goddess growing pains. But her new-found, uncontrolled powers begin attracting attention from the wrong sort of… people, putting Persephone in unimaginable danger. When Hades – yes, that Hades – intervenes during a kidnapping attempt, Persephone’s life just gets a little crazier when she discovers that to save her from an unimaginable fate, Hades had to do the also unthinkable and claim her as his queen. Sixteen, a goddess who hasn’t fully come into her powers, and married to the Lord of the Underworld. Who saw that coming? Not Persephone, surely. Her world having been turned upside down, Persephone must begin to adjust to her new reality as she comes to certain realizations about herself, her capabilities, her feelings for Hades, and who it is that controls her fate. The girl & the goddess. Persephone is a very endearing and empathetic character – a goddess, but also a normal, authentic teenage girl with the usual assortment of teenage worries and insecurities. Bevis strikes a fantastic balance between Persephone’s human-born innocence and naivete and her goddess-like maturity and inner strength. She’s sweet, not naturally confrontational or very outgoing, and she has a compassion and love for people that isn’t common among the Greek deities. However, meeting Hades brings out a very different side of Persephone – being around him causes her to be more tenacious, stubborn and more aggressive than she was prior to their meeting. It’s a gradual change, and it’s so fun to see this teenager goddess go toe-to-toe up against this ageless, immortal, slightly terrifying being… and hold her own to boot. Her growth as a character is wonderful as she undergoes the typical, and yet not-so-typical, foundational moments of growing up – discovering who she is, who she wants to become, and who her responsibilities dictate she must be. The Lord of the Underworld. Hades as a viable YA love interest? Yeah. Challenging. I mean, with a literary legacy spanning thousands of years, plus his title and reputation, he’s not exactly bring-‘im-home-to-meet-the-parents kind of material. You don’t give Hades a curfew by which he must have your teenage daughter home by, right? That’s just asking to be smited? Smote? Smitten? My poor verb tense knowledge aside, there would most likely be smiting involved. And yet, this Hades is different than the various incarnations I’ve read or seen over the years. While still retaining that dark, slightly sadistic side, that impressively intimidating divine otherness, and a healthy dose of entitled arrogance, Hades – at heart – isn’t such a bad guy. Though he’s nowhere near a “bleeding heart,” Hades is a fair ruler, and surprisingly understanding toward those who reside in the Underworld. Seems as though a little humanity, the tragedy of death, or the profound sense of loss felt by those souls who’ve been sent to his realm has made a bit of an impression over time. As with Persephone, Hades character strikes just the right tone between the human and the divine, and it’s not hard to see why Persephone could possibly fall for him. A May-December romance. Or more accurately, a November-April romance, but you know what I mean. Updating this particular love story for modern times has the potential to be tricky. Firstly, the age gap. Though he might look like a early-twenty-something A&F model, Hades is still… well… ancient. He’s been around the block countless times, and if there was ever a confirmed bachelor who was set in his ways… Hades would be it. However, despite the obvious age difference and contrast in life experience, Bevis creates a romance between these two that is believable. Hades might have several thousand years on Persephone, but she can certainly hold her own against him. She challenges him, and it would appear as if that’s something that hasn’t happened in quite awhile… if ever. Persephone brings out a rare vulnerability in Hades while he brings out the fire and fight in her, and it’s really interesting to watch their relationship progress as they’re forced to be in close proximity to one another, slowly seeing the other for who they truly are. Persehone 2.0. One of the reasons I enjoyed this story so much is because while it retells and reinvents the original myth, the story we’re familiar with is only the tip of the iceberg. In this version, Persephone’s stint in the Underworld is the beginning of a much bigger, more complicated plot. While this book deals largely within the confines of the original myth, Bevis lays some fantastic groundwork for the next book, right up to the “OMGOSH!” of a cliffhanger ending. I am so very curious to see how all of this plays out in Daughter of the Earth and Sky. Overall. Holding to the spirit of the original myth, Kaitlin Bevis successfully expands upon the story of Hades & Persephone, reinventing, modernizing and weaving a romance and plot that is both compelling and timeless. Amazing review! I am so glad to see that you enjoyed this book! I just got it for myself and I’m really excited to start it. I love all things Greek mythology so this book just spoke to me haha. YAY! I hope you enjoy it! Greek mythology rocks so hard. I know… I have the urge to go buy a pomegranate. Oh, thank you so much! 😀 And I hear ya on the loooooooong TBR, but I’m so glad you’re going to try this one out! I hope you enjoy it! Okay, so I don’t know how I missed this one. I love retellings and Greek mythology, so this sounds flipping awesome. I like that Hades’ character stays true to the myths, but that he’s also a believable love interest. Great review, Dani! I’m going to have to get my hands on a copy. Thanks for sharing, otherwise who knows how long it would’ve taken me to come across this! YAY!!! I really like Greek mythology retellings too… and I think I actually ran across this one while browsing on Amazon randomly. I really hope you enjoy it, Randi! Thanks so much for taking the time to comment!